This is the world's lightest micro satellite so far that was placed on space. The satellite was designed by Indian students who work with private organisation "Space Kids India" is lighter than a wooden chair weigh 1.26 kg only and without a single cost coming from the Indian Space Research Organization (ISRO). Although, the project was perfectly done over a span of six years, Srimathy Kesan told in a report who's overseeing the project. This satellite weighs just 1.26 kg and is lighter than a wooden chair. It cost Rs 12 lakh to make it and was ready in just six days. But, it is not enough to create something, you have to perfect it - the group of students took six years to perfect this satellite. 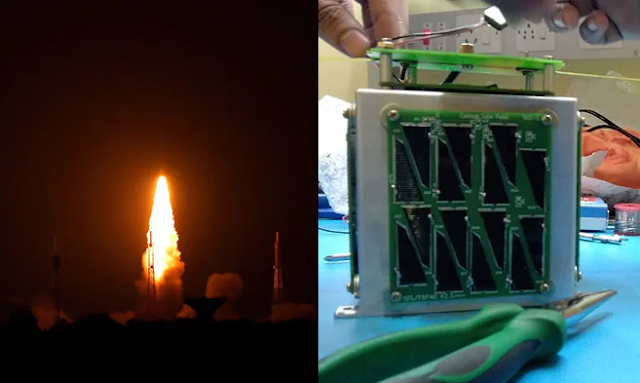 The Indian Space Research Organzation (ISRO) have successfully launched an imaging satellite Microsat-R along with a student payload 'Kalamsat' in Sriharikota, Andhra Pradesh, on January 24. The Kalamsat V2 will serve as a communications satellite for ham radio transmissions used by amateurs for non-commercial activities. However, the main payload on Thursday launch was the 740-kg Microsat-R that will be used to take high-resolution photos of Earth fro defence research.